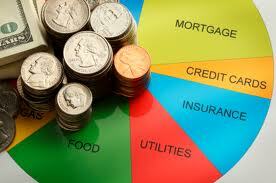 Developing a household budget is a good way to save money and balance expenses with income. Being aware of sources of fast loans will also help with a budget. Repaying cash loans and credit cards is a necessary step for budgeting. The first step for a budget is to look at expenses from the previous year. Search for bills, bank statements and receipts. By detailing expenses, the income needed to meet them can be projected. In this way, an idea of how much money is needed for the year is ascertained. In the same way that looking at expenses can help prepare a yearly budget, you need to also look at your income. Examine wage slips, bank statements and investment statements. This should produce an estimate of income for the last year and for the present year. Hopefully the income found will cover the projected expenses for the year. If it does not then some budgeting measures must be implemented. The idea is to have more income than expenses and the easiest way to do this is to reduce expenditure. The first step to reducing expenses is to divide them into needs and wants. For example, toilet paper is a need, but take away lunch is a want. After dividing expenses this way, it is then time to reduce the wants. By reducing spending on wants, such as takeout food, expenses are reduced. Think of taking packed lunches to work or school, making coffee at work rather than buying it and perhaps, if possible, walking or cycling places rather than driving or using public transport. The latter strategy will help with transport and petrol costs. After determining needs and wants, there are other ways to reduce expenditure. Simple strategies such as reducing electricity bills by turning electricity off at the power points can reduce the size of the bill. Other savings in water and gas bills can be gained by reducing shower times and gas usage. Looking for alternative heating methods such as blankets rather than heaters or air conditioners can also reduce costs. Taking the time to look at major expenses and looking at innovative ways to reduce them, will save the household budget with little pain. If reducing expenditure is not producing a balanced budget, then it is a good idea to look at ways to increase income. One easy way to do so is to take out a cash loan. These loans can help with emergency expenditures and help the family budget during times of crisis. A fast loan can meet emergencies quickly with little fuss. Planning a budget can prevent families from falling into debt when wages are low and employment unstable. With the global financial crisis it is a good time to look at how the household can reduce expenditure and increase income. Having cash loans available will also help cover emergency situations. Being aware of the household financial position will be an advantage when times are tough.